Understanding Medicare is an important part of your overall retirement planning, but it’s so confusing and complicated! But I’m here to help you understand Medicare and how it will impact your retirement plans. There’s a lot of information here, so grab a cup of coffee and get comfortable. Then there are many more types that are specific to certain situations. Most of these are Medicare Advantage plans, which we’ll discuss below. Most people become eligible for Medicare when they turn 65, based upon their work record or the work record of their spouse. There are other ways to qualify, such as through Social Security disability income. Medicare costs vary based on the individual, which parts you have, and which choices you make. A worker, or spouse, who has worked 40 quarters, will pay no premium for Medicare Part A. If you don’t have 40 quarters of credit, and you’re not married to someone who has worked 40 quarters, you can pay for Medicare. Medicare Part A has a pretty large deductible for the first 60 days of hospital coverage, and co-insurance costs for each day thereafter. Medicare Part B has a monthly fee, which changes every year. The standard monthly premium for Medicare Part B enrollees will be $134 for 2018. However, the amount of the Part B premium that you pay may be different. There are two different adjustments that can apply to the amount you’ll pay for Medicare Part B. They are the Hold Harmless provision and the Income Related Monthly Adjustment amount. Part B does not cover everything. There is a yearly deductible ($183 for 2018.) After that deductible is met, you will pay 20% of the Medicare-approved amount for services, therapies, and durable medical equipment. The Hold Harmless Provision ensures that even though Medicare Premiums go up each year, a Social Security beneficiary won’t ever get a smaller net benefit from Social Security. If you are having your Medicare premium deducted from your Social Security check, and the Medicare Premium goes up more than the Social Security Cost of Living Adjustment (COLA), then the increase on your Medicare Part B Premium is limited to the amount of your Social Security COLA. Folks who are using Medicare, but haven’t yet filed for Social Security benefits, and therefore are not having their Medicare premium deducted from their Social Security benefit, are not protected by the Hold Harmless provision. The Income Related Monthly Adjustment Amount (IRMAA) applies to those individuals with higher income. For an individual, the Medicare Part B premium increases if your income is more than $85,000 in 2018. For a married couple, the Medicare Part B premium increases if your income is more than $170,000 in 2018. The amount that your premium goes up increases with more income. Medicare Part C has a monthly premium. The amount will vary depend on the plan you choose. Your specific Medicare Part C plan may have a deductible and/or cost-shares or co-pays. The cost of Medicare Part D varies depending on the policy that you choose and may be increased based upon your income. There is a penalty if you had a period of time when you were eligible for Part D but did not have Part D coverage. If you are already receiving Social Security benefits when you turn 65, you will be automatically enrolled in Medicare Part A and Part B. If you’re not receiving Social Security benefits when you turn 65, you need to sign up for Medicare Part A and Part B either online or at the Social Security office. If you are eligible for Medicare, you should be receiving many offer from Part C and Part D providers. How Do You Pay For Medicare? If you are already receiving Social Security benefits when turn 65, your Part B premium will automatically deducted from your Social Security benefit payment. If you’re not receiving Social Security benefits, you’ll need to pay those Medicare Part B premiums until you start drawing Social Security benefits. Pretty much everyone should sign up for Medicare Part B. If you don’t sign up for Part B when you’re first able, you may pay a penalty when you do sign up for Part B. There is a situations where you’re not required to sign up for Part B immediately. If you are still working, and your company who offers medical coverage and has more than 20 employees, you may not be required to begin Part B immediately. However, even some companies who meet those qualification may require that the employee take Part B. If you think you may not be required to start with Medicare Part B, you need to double check all the details. If you do meet this exception, when you do stop working, you must sign up for Part B within 8 months of working. 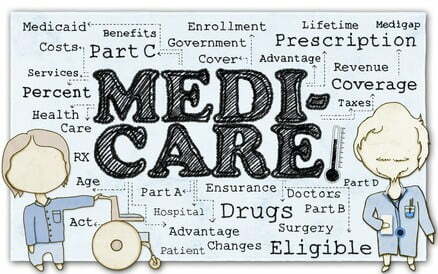 There are special plans that encompass all the parts of Medicare Parts C and D. They are called Medicare Advantage plans. These plans are low cost and often offer a range of services that aren’t covered under traditional Medicare plans. On the other hand, they often have significantly lower benefits than the standard Medicare plans. You’ll get a lot more care with traditional Medicare and a supplement than you’ll get with a Medicare Advantage plan. If you are a young, health retiree, a Medicare Advantage plan may be an economical choice for you. Some people receive retiree Medicare supplement through their former employer. Everyone else who wants Part C coverage has to purchase it. These are private insurance programs with different costs, coverages, and exclusions. There may be deductibles and/or co-insurance or co-pays. When considering Medicare supplements, you should check to ensure that coverage is available in your area and whether your preferred doctor participates. Part D is the prescription drug coverage. It’s a relatively recent program, started in 2006. You get to select your own Medicare Part D provider, or you can use a Medicare Advantage plan that rolls the prescription coverage into your Medicare Advantage plan. It’s important to understand how Medicare Part D work – it can be a little tricky. Medicare Part D policies are private policies with different costs. You should check to be sure that any drugs you take are covered by the policy you want to purchase. Medicare Part D policies also have a yearly open enrollment period, but benefits can change from year to year. There is a very confusing concept in Medicare Part D: the donut hole. Basically, there are three different segments to your coverage, depending on your total prescription drug costs for the year. It is called a donut hole because the first and last segments cover more, and the middle segment covers less. The first segment of coverage is called the Initial Coverage Limit (ICL.) That amount is $3,750 for 2018. For the first $3,750 (in 2018) in total prescription drug costs (paid for by both your Part D provider and you,) you will pay the cost-share or co-pay amount that is listed in your policy. Then, once your total drug costs (paid for by both your Part D provider and you) reach $3,750, you will pay 40 to 50% of the cost of that drug until you reach the next threshold, which is when you, individually, have spent a total of $5,000 on prescriptions for the year. This is the “hole” in the donut. Note on the donut hole: You’re not actually paying the full amount of the prescriptions that count towards your $5,000, because during the donut hole, the drug manufacturer’s contribute a significant amount towards those drug costs, and those manufacturer’s contributions get counted towards your costs. Once your total drug costs (paid for by both your Part D provider and you) reach $5,000 , you will then pay only the greater of 5% or $3.35 for generic or listed drugs, and the greater of 5% or $8.35 for other drugs. When your doctor recommends medical care, you will need to get approval from Medicare. Sometimes you get approval before the procedure, and sometimes you get approval after the procedure. If Medicare denies your request for approval or your claim for service, you’ll have to do a little extra work. Your denial will come the directions to appeal. Eighty percent of Medicare appeals are paid on the first appeal. Health care costs are an important part of your retirement finances, and Medicare is a key part of how much your health care will cost. Understanding how Medicare will help you make smart choices.